Enjoy Happiness and Comfort offers accommodation in Gardena 1.4 km from Hustler Casino. Guests are welcome to enjoy the free WiFi throughout the property. Private parking is available at the homestay. 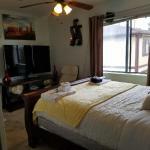 The nearest airport is Los Angeles International Airport 13 km from Enjoy Happiness and Comfort.